I have a perverse sense of what constitutes good beach reading. I tend to stay away from the quick easy reads while sitting under my umbrella. The past two vacations I have spent on the beach I have opted for The Power of Myth by Joseph Campbell, The Immortal Life of Henrietta Lacks by Rebecca Skloot, and Theodore Rex by Edmund Morris. This review is about Ms. Skloot’s book inspired by HeLa cells and the woman who they came from. Rebecca Skloot became familiar with HeLa cells, the first immortal cells ever reproduced in a lab during her college days. Finding herself mesmerized Skloot set out to discover the person behind cells. However, she discovers more than she anticipated over the course of several years of research. She discovered the story of Henrietta Lacks, born in the rural south to poor tobacco farmers and the family she created for herself in Turners Station, Maryland. Skloot attacks the layers of the story by flipping back and forth through time and topics. This non-linear story could at times be confusing if not for Skloot’s perseverance in editing and the use of a timeline at the beginning of each chapter. This book is at once the story of Henrietta’s life, the science and discoveries enabled by the discovery of HeLa cells, and the changes in patient rights over the past 60 years. This is a heavy, engaging read. Well worth your time. This book. This freakin’ book. I tweeted it as my Friday Read a couple weeks back and the lovely MsWas told me to get the tissues. While I didn’t out and out cry I did want to curl up with a blanket and hug something or someone when I got to the conclusion. But I was warned about that (h/t narfna). This book has been reviewed a few times for cannonball, but it’s my first experience with John Green, and although this is YA, and to a certain extent reads that way, it was good times. Green kept me on my toes even when I was pretty sure I knew what was coming. It should be known that this book’s main characters are all cancer patients at various stages. You definitely need to know this before you sign on to read it, because as I said before – you might need tissues or a blanket to get through the end. Our narrator through the journey is Hazel, she is sixteen and cancer has gone ahead and settled in her lungs. There is a miracle drug (just in the book) that has stopped the growth and for the time being she’s holding steady but required to bring her own oxygen wherever she goes. However, her mother has decided that she’s depressed and with her doctor’s direction, Hazel is forced to attend a support group. Hazel doesn’t want to go, stating that depression is merely a side effect of dying and not to be worried about. But, as it is in the world of fiction, it turns out to have been for the best that she attends. At support group we meet Augustus and Isaac. Isaac is a known quantity to Hazel. Augustus on the other hand is something new altogether. I appreciate that Green wasn’t afraid to write the meet cute in a cancer support group. Life doesn’t stop just because you have cancer. Hazel shares with Augustus her favorite book and they begin their relationship from there. I won’t devolve into a plot summary. But the relationships these characters share read and ring true. You get it all with these characters: hope, love, sorrow, tragedy, triumph, humor. The whole deal. Green is careful to point out in his Author’s Note that this book is not about anyone, and is strictly speaking a work of fiction. I respect that. I will however point out The Fault in Our Stars was dedicated to Esther Earl, who’s picture reminds me of what I thought Hazel looks like. Her family has set up a foundation in her honor to support cancer families, This Star Won’t Go Out and is worth a visit, particularly if you have some dollars you can afford to donate. Here’s the problem that I’m running into. I’m reading a couple of big books at the moment with a lot of information to unpack (I just finished The Illuminator, working on Theodore Rex and Ready Player One (FANTASTIC!)) so I keep turning to quick, fluffy reads in-between. But the problem becomes what to say about them? Specifically what is there to say about Nora Roberts’ Vision in White? Remember before when I said Roberts has a formula – a highly enjoyable, reasonably well written formula – that allows the reader to telegraph the upcoming events of her stories with out too much effort? This book is perhaps the best exemplar of that yet. I really like the set up of the story in this first in a quartet book. There are four friends since childhood (which reminds me of the post on pajiba about friends) who used to play Wedding Day in which they would plan out and enact weddings between themselves, siblings, animals, etc. As adults the four, Parker, Laurel, Emmaline, and Mackensie, have each fallen into their own particular niches to create a high quality wedding and event planning company Vows based out of Parker’s family estate. Keeping up? However, this story is about Mackensie, resident photographer. Mackensie, or Mac, is the resident photographer. And I do mean resident. Her photography studio is on the Brown estate in the former guest house. Early in the story the romantic lead shows up in the form of one Mr. Carter Maguire. Carter is everything that Mac is not. Shy, well-educated, rooted in family, and a teacher. They however do share a spark a – voila – a tense dating relationship begins where Mac is likely to run off in fear at any moment. In a benefit of Roberts’ style we get inside Carter’s brain as well and he’s just as perplexed by Mac, even though he’s been harboring a crush for over a decade, as she is by him. I know this is more a recap than a review, but I feel as though you should be warned before diving in. Are you looking for a quick read (although topping 300 pages) that is the first in a four book series focused around the world of wedding planning with four friends who literally live in each other’s backyard? Can you handle being able to telegraph the story for yourself? Then happy reading. It was a pleasant read that left no lingering effects for this reader, making it not the best Roberts’ has to offer. I received The Illuminator from my trusty friend with the reading materials and she told me nothing of the plot except that I would love it, be ridiculously angry with it, and that it was set in the 14th century. This is not a lot to go on, but I knew that illuminators were the lovely lads who painted all the detail work into those beautiful manuscripts the monks were busy copying. So, I jumped right in. She was correct on all three counts. I did love it. I loved it enough to keep reading it although I felt my ear drum was going to explode on a flight. I loved it enough to keep reading it when I was sure it was going to do nothing more but piss me off. I love it enough to tell you to read it, but only if you are like my friend and me and enjoy a good emotional thrashing. And yelling about characters that have disappointed you (thus the ridiculous anger). 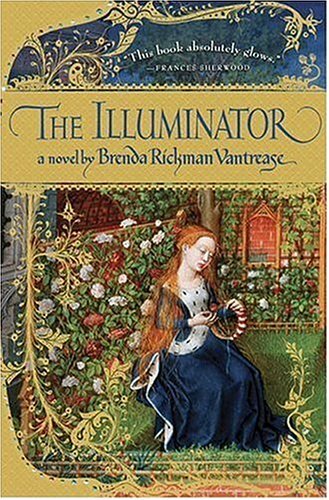 The Illuminator is Brenda Rickman Vantrease’s first novel. Previously she was an English teacher and a librarian. Vantrease uses her knowledge of the time and, in time honored historical fiction strategy, takes what is known of a few big names (Bishop Henry Dispenser, John Wycliffe, Julian of Norwich, and John Ball) and create a plausible story in which they appear. The novel roughly covers the years 1379-1381 and leads up to the Peasant’s Revolt of 1381 and the various ecclesiastical shenanigans that are going on at the time. Our main characters are the widowed Lady Kathryn of Blackingham, her family and servants on the manor, and Finn the illuminator. Each character has a story arc of their own which work well to bring to light the reality of life in the time as well as tell a good story.